Why does it seem like difference and addition modes aren't complimentary? When I instead take the result of the "Copy Visible" step, which should be the difference between the original (B) and the version with the text removed (A), which appears to be just the text, and paste it into a third layer on top (I'll call it D, because it's different than the C in the other question), but with the mode in "Addition" instead of "Normal", overlayed on top of A (the background only), it shows the text as expected, but it's decidedly dimmer than I'd prefer. I'm having trouble figuring out where the data I think should be there seems to be lost. I can get close to what I want by increasing the brightness and the contrast, and a small adjustment to colors, but why is it a problem to being with? is there a different mode I should use on one or both steps? To answer your question initial question, difference is not subtraction, it is more like its absolute value, so it is not the opposite of addition (which subtraction is... until you consider that you are limited to the 0-255 range so you overflow/underflow pretty quickly). 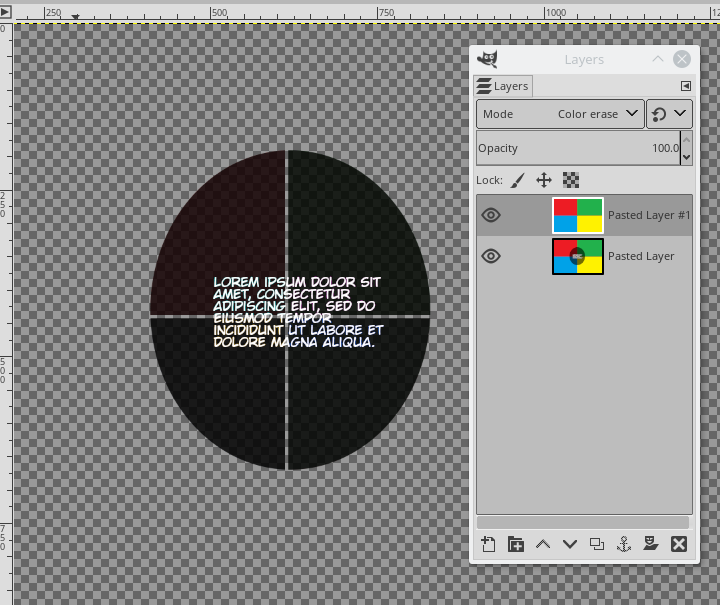 As the answer says "Further operations on the layer mask (I recommend using Colors->curve) can adjust the opacity/transparency of the areas on layer C.". What is copied in the mask is the difference between the two images. Technically it is not often the 255 value that would be required to have a full selection for what you want to keep, it is more likely some gray, which means partial opacity. So you have to apply one of the Color tools (JSB recommends Curves, but IMHO Levels will work just as well) to boost the mask to full white where you want to keep things, and in Levels, use the middle handle to adjust the transitions. Not the answer you're looking for? Browse other questions tagged gimp blend-modes or ask your own question. Why is color burn not affecting a white channel?